To find out more about UD Almeria Football Club click on the logo. A squad of 25 players and thirteen officials from Unión Deportiva Almería (Almeria Football Club) – which currently competes in Liga Adelante (Spanish Division Two) returned to the Desert Springs Resort for the second consecutive year to enjoy the facilities of the Desert Springs Football Academy for their pre-season training camp between Monday 23rd - Tuesday 31st July. “I knew that UD Almería had already used Desert Springs last year, and as we have repeated this year, then something must be working well! The playing surface and thickness of the grass was just perfect, and the daily assistance of the maintenance crew has made a difference. Our accommodation at the community of Las Sierras was very quiet and convenient for us, providing a lot of privacy with no disruptions. were fantastic and we have felt very well attended. 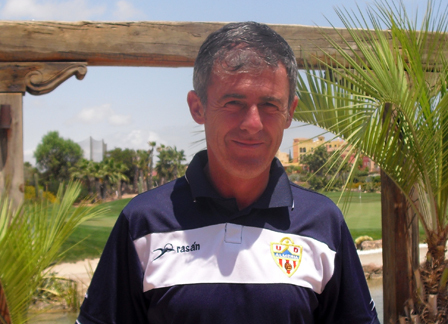 During their stay, the Almeria players and officials were accommodated in some of the privately-owned apartments normally reserved for holidays and short breaks at Desert Springs and the resort’s executive chef was on hand to cater for the special dietary requirements of individual players dining in the resort’s two restaurants – the award-winning El Torrente and the Croc Restaurant, part of the family-friendly Crocodile Club. Subject: Reporting on the visit of UD Almería for their official 2012 Pre-Season Football Training Camp. have repeated as we have, then something must be working well! Title: UD Almeria Select Desert Springs Resort for Pre-Season Training for Secound Consecutive Year! Following on from the success of their inaugural training camp in 2011, Union Deportiva Almeria (Almeria Football Club) have selected the Desert Springs Resort to be host once again to their pre-season training camp between Monday 23rd - Tuesday 31st July. A squad of 26 players and ten officials from Almeria Football Club – which currently competes in Liga Adelante (Spanish Division Two) will precede the arrival of the teams ‘B’ Squad comprising 24 players, who will also reside at the resort for a 3 day training camp between Wednesday 1st – Friday 3rd August, to benefit from the facilities of the Football Academy established at Desert Springs. During their stay at Desert Springs the Almeria players will benefit from training and coaching on the first international-size quality grass pitch in Almeria complete with; floodlights, shower and changing facilities, a referee changing room, a goal-keeper training and five-a-side games area, and a hard standing area which provides outside space for facilities such as a free weights gym, stretching mats and a medical area. Simon Coaker, sales and marketing manager at Desert Springs, remarked that the Club’s experience during last year’s inaugural training camp at the resort influenced their decision to return for their 2012 training camp. “At the completion of last years training camp the Club’s Manager was so enthusiastic about the caliber of the resort, its football pitch, other sports facilities, restaurants, accommodation and staff, that he pledged for the team to return. Well, not only has that word been kept but this year we shall also be host to the ‘B’ team,” said Simon. Spectators will also be welcome to visit the Football Academy to watch the training sessions. During Football Training Camps, players can make full use of the 18-hole Indiana golf course and enjoy opportunities to swim, play tennis and use the gymnasium, trim trail, jogging tracks, paddle tennis and beach volley ball courts. They also have access to the resort’s Private Reserve which incorporates a spa, private sauna and jacuzzi suite, personal fitness workout room, games room with bar, and a home cinema. Accommodation for the players and officials is in some of the privately owned apartments normally reserved for holidays and short breaks at Desert Springs. Union Deportiva Almeria (Almeria Football Club) training at the Desert Springs Football Academy last year. 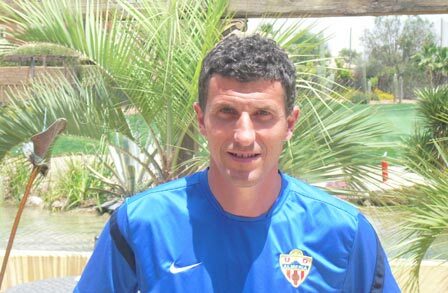 Title: UD Almeria Pre-Season Training at Desert Springs a Resounding Success! A squad of 24 players and twelve officials from Almeria Football Club – which currently competes in Liga Adelante (Spanish Division Two) followed in the footsteps of other teams such as Byrne, Honefoss and Shrewsbury Town Football Club, by enjoying the facilities of the Football Academy established at Desert Springs for their pre-season training camp between Monday 18th - Saturday 30th July. The Club’s Manager, Lucas Alcaraz, was so enthusiastic about the caliber of the resort, its football pitch, other sports facilities, restaurants, accommodation and staff, that he has pledged for the team to return. “The conditions of the Football Pitch are absolutely superb and ideal for training. Moreover, our preferred specifications have been accommodated on a daily basis. When a professional football team travels for a Pre-Season Training Camp, there are always small inconveniences, schedule changes and last minute problems that are disruptive and unfortunately cannot be resolved. During their thirteen-night stay, the Almeria players and officials were accommodated in some of the privately-owned apartments normally reserved for holidays and short breaks at Desert Springs and the resort’s executive chef was on hand to cater for the special dietary requirements of individual players dining in the resort’s two restaurants – the award-winning El Torrente and the Croc Restaurant, part of the family-friendly Crocodile Club. Subject: Reporting on the visit of UD Almería for their official 2011 Pre-Season Football Training Camp. I met with the UD Almería Manager, Lucas Alcaraz, for an informal meeting to receive his views and opinion on how he felt the visit to Desert Springs Resort had gone to get as much feedback as possible. Union Deportiva Almería (Almeira Football Club) selected the Football Academy at the Desert Springs Resort to be host to their official Pre-Season Football Training Camp between Monday 18th - Saturday 30th July, 2011. A squad of 24 players and twelve officials from UD Almería – which currently competes in Liga Adelante (Spanish Division Two) also benefited from access to and use of the 18-hole Indiana golf course and golf academy. They enjoyed the opportunity to swim, play tennis and use the gymnasium, trim trail, jogging tracks, padel tennis and beach volley ball courts. They also had access to the resort’s Private Reserve which incorporates a spa, private sauna and jacuzzi suite, personal fitness workout room, games room with bar, and a home cinema. Accommodation for the players and officials was in some of the privately-owned apartments normally reserved for holidays and short breaks at Desert Springs. The resort’s executive chef was on hand to cater for the special dietary requirements of individual players dining in the resort’s two restaurants – the award-winning El Torrente and the Croc Restaurant, part of the family-friendly Crocodile Club. The Apartments at Las Sierras are superb. Because we usually stay at Hotels during the season, we were expecting that sort of operation. Nevertheless, we are very satisfied with their location, quality and privacy. Excellent service. The food is great and meals are always served as scheduled. It could not be any better! Each department throughout the Resort has been very supportive during our stay. Also, attention to detail and flexibility are key for the training success. We have found that the professional team at Desert Springs has smoothly attended to all of our “last minute” requests in an efficient manner. The conditions of the Football Pitch are absolutely superb and ideal for training. Moreover, our preferred specifications have been accommodated on a daily basis. They were fine, including the Gymnasium. We have had an extremely positive experience at Desert Springs, and in my opinion the team will surely be interested in returning in the future. venue where all aspects have run smoothly, and requests have been accommodated. Thanks to their facilities and professional staff, we have been able to fully concentrate on the training camp.